Although few and far between one can find beautiful "Curley" Walnut from the Claro Walnut trees of Europe and California. This strain was carried to California in the early 1800's by Spanish migrants who planted them for their shade and the nuts. No stain is needed, clear lacquer brings out the curley figures. Few pieces of lumber can match the outstanding beauty of this "Curley" Walnut. Zebra wood trees grow mostly in West Africa (Nigeria, Gabon and Carmeroons). It is a hard, fairly heavy wood with a few pores but mostly tight grain and pronounced stripes. It finishes to a nice luster and is usually not stained to give a natural light color with dark stripes. Honduras Rosewood is a well known member of the rosewood family which grows exclusively in Belize. 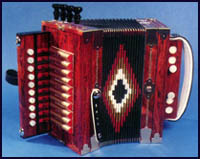 It is very hard, fairly heavy and can be worked into a beautiful finish. Purple heart is a very well known exotic wood found through most of Central and South America. It is hard and naturally purple. The color goes well with flowered bellows. A small percentage of the North American Maple has curley figures in the grain (more like bars across). This maple came from a mill in Elkins, WV. 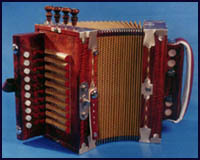 Some accordionists like bright color stains like this green but it also comes in red and blue. 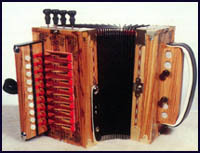 Curley Maple is very popular for Cajun handmade accordions.